We recently wrote about the many existing venues, activities, and materials designed to encourage public dialogue and informed discussion about animal research. Many individuals, institutions, and organizations contribute to public outreach and education efforts, and also take active roles in dialogue about continuing changes in practice and policy concerning animal welfare and the conduct of animal research. This post is the sixth in a series (Part 1, Part 2, Part 3, Part 4, Part 5) hosted by Speaking of Research to highlight a wide range of individuals and groups devoted to consideration of animal research. Our latest contribution comes from Michael Brunt, who received a M.Sc. in Applied Ethology and Animal Welfare from the Ontario Veterinary College, University of Guelph. Michael is a member of the International Society of Applied Ethology and a Registered Master Laboratory Animal Technician with the Canadian Association for Laboratory Animal Science. Actively engaging the public can be an intimidating concept for many people and institutions. The fear of the unknown is daunting. How will I be received? What will people ask? What if I don’t know the answer? Realistically, we will never know all the answers but with a little preparation the opportunity to interact with the public during community outreach has tangible and substantial benefits. The Central Animal Facility at the University of Guelph opened its doors for the first time in 1992 to invite the friends and families of the employees into our facility and demonstrate how proudly we care for our animals. The yearly open house organically evolved and the open invitation began to include the friends and families of our researchers, members of the Animal Care Committee, the campus as a whole and eventually the entire Guelph community. The spring of 2012 marked the 20th anniversary of our open house in which roughly 250 people participated in the three hour event. 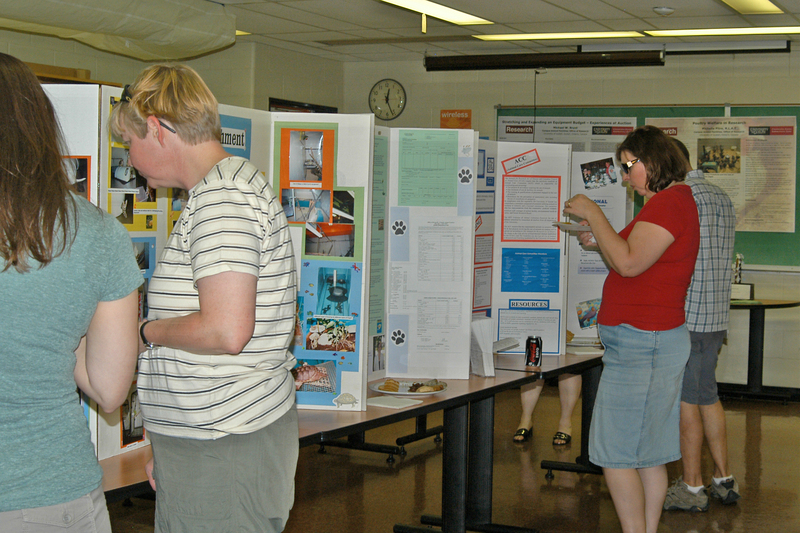 The open house participants were able to take advantage of guided tours of the facility and read numerous display boards explaining the imperative role of animals in research and also the people, in various professional roles, that care for those animals with compassion and respect. 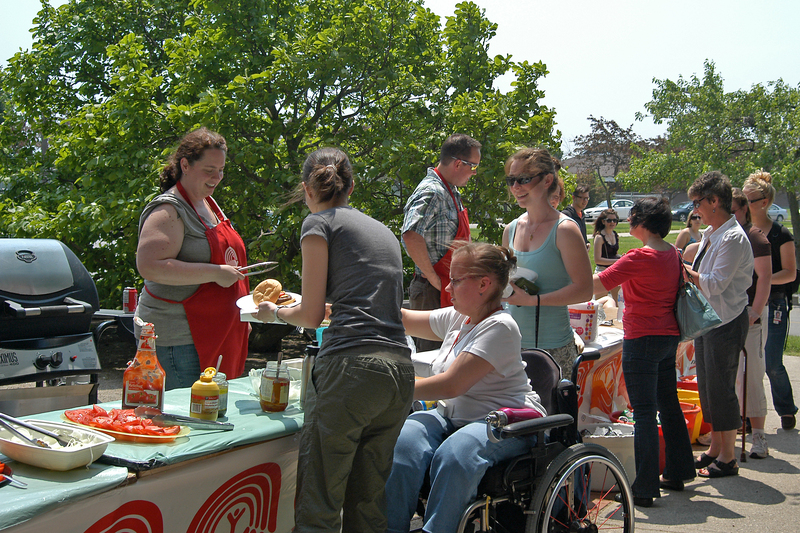 Other activities hosted at the event were a barbeque and raffle to raise money for local community and animal charities. Welcoming our community into our workplace and encouraging them to ask questions fosters an understanding surrounding the use of animals in research while building an open relationship of trust. A reporter from the local paper published a story discussing her experiences at our open house. The Central Animal Facility provides housing and services to numerous departments on campus. The dogs are primarily a part of the Ontario Veterinary College’s teaching and research colony. The teaching procedures allow the veterinary students to learn the skills and compassion needed to care for animals. The research projects are primarily funded by Pet Trust which is entirely dedicated to advancing the health and well being of companion animals. Many of the other animals are part of studies to understand basic scientific processes like nausea. Rats are providing valuable information allowing for clinical treatment of chemotherapy patients in both humans and dogs. However, no matter how positive and successful an event may be it is not surprising that there can be some negative feedback. While it is quite rare to receive negative feedback regarding our community outreach, a letter to the editor was published that focused on the use of animals in research rather than the open house event itself. The Central Animal Facility participates in many other ongoing community outreach programs including volunteer animal socialization programs, facility tours and work placement programs. Although all programs are valuable the co‐operative work placement program, in which high school students work for three months with our technicians, provides a unique opportunity to interact with our community. The eagerness of the students to learn and explore ethically challenging questions makes this connection particularly rewarding. The strong bridges that are built through public outreach is demonstrated when a community member, who had previously completed a high school work placement at our facility, spontaneously responded to the above letter to the editor. Public engagement represents a long term commitment of support and involvement in your community. An institution that promotes a culture of community outreach builds strong bridges in which your community stands behind you even when they are not asked. The public in an engaged community feels empowered to ask questions, understands the issues surrounding the use of animals in research and welcomes you as part of the community. Public engagement is time well invested. Posted on August 9, 2012 October 15, 2012 by EditorPosted in News, Outreach NewsTagged animal research, benefits, chemotherapy, community, dog, Many voices, nausea, Ontario Veterinary College, outreach, public engagement, rat, student, University of Guelph, Veterinary training. Next Next post: Interfacing with the nervous system: Studies in mice and rats show the way.